Since 1913 Carpenter & Paterson, Inc. has specialized in the manufacture and distribution of a complete line of pipe hangers and supports for commercial and industrial applications. Our designs are in accordance with ASME B31.1 and MSS-SP 58. We have extensive capabilities to design, and fabricate support systems utilizing the latest technologies that will satisfy all customer requirements. Our sales and engineering group offer a full range of experience in the areas of product design and value engineering and are available to discuss your project needs. Our supports have been specified and installed on major water treatment, pharmaceutical, process piping, petro-chemical, hospital, and school buildings as well as many other industrial projects throughout the world. 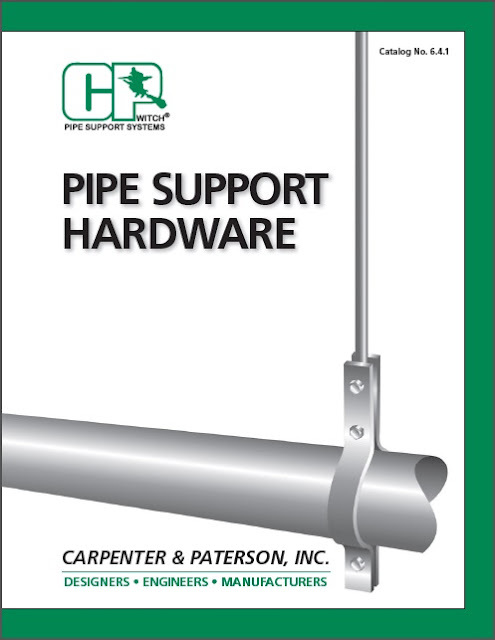 Carpenter & Paterson, Inc. products and the “Witch” trademark are synonymous in the pipe support industry for quality. Our mission is to support the mechanical industry with timely estimates, efficient designs, and full-line inventories that will allow us to meet our customers critical schedules.